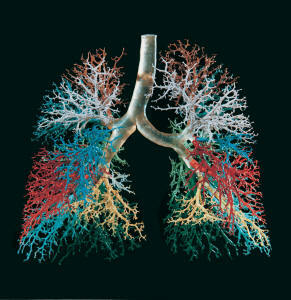 To understand treatment it helps to know the basics of lung physiology. The larger bronchial tubes also have muscles which go round and round the tubes, and they are lined with cells which manufacture mucus and sputum. The mucus normally causes no problems because the cells that cover the inside of the bronchi have tiny cilia on the inside surface which are constantly wafting the mucus upwards to the trachea to be swallowed harmlessly. If there is too much sputum for the cilia to clear, it has to be coughed up to clear the tubes. When an asthmatic patient inhales an allergen to which the bronchi are sensitive the result is contraction of the bronchial muscles, swelling of the wall of the bronchus and the secretion of thick sputum which partially obstructs the airways as it is so thick and sticky that the cilia cannot move it.. The sputum contains cells which are ordinary white cells in an infection, eosinophils in allergic asthma, or a mixture of both . The bronchi become clogged with sputum, causing loud wheezing on breathing out. Because It is easier to breathe in than out in asthma air becomes trapped in the lungs, and enough fresh air does not reach the alveoli to deliver oxygen to the blood and get rid of the C02. The muscles round the bronchi can be relaxed by inhaling bronchodilator drugs like Ventolin (salbutamol) which act immediately, but only last for a few hours. 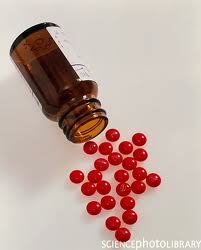 Long acting bronchodilators or oral steroids may also be needed such as Serevent (salmeterol). Many similar drugs are in common use. The secretion of excess sputum caused by the allergic reaction can be stopped by giving oral steroids, which are absorbed into the blood circulation and distributed, by the blood vessels which accompany the bronchi, to the lining of the bronchus. The effect is to suppress the allergic reaction, stop the production of thick sputum, clear the airways, and relieve the asthma. Inhaling the steroid from an aerosol, so that the drug is deposited on the inside of the bronchi without flooding the circulation with steroids and affecting the whole body, had been tried without success in Edinburgh from 1968. This was the situation in 1971, when I was given the opportunity to conduct a final trial before the makers threw the aerosol away as useless. For this trial I selected allergic asthmatics with eosinophil cells in their sputum, and they were all using their own peak flow meters to produce objective data. The effectiveness of the steroid aerosol was soon obvious, the makers decided not to bin it, and the results were published in the BMJ. Soon it was authorised for prescription as “Becotide” in UK, and trials all over the world confirmed our results. Most importantly, many patients dependent on oral steroids for years could now be controlled by inhaled steroids instead, without the side effects. To a large extent it no longer mattered what was causing the asthma because most cases could be controlled with Becotide or similar inhaled steroid, plus bronchodilators to control spasm of the muscles round the bronchi. Since then many other inhaled steroids and bronchodilators have been developed, but the general principles of treatment are the same as described above. In my opinion, and that of most consultant physicians nowadays, all patients with unstable asthma liable to severe attacks should have a supply of steroid tablets in their possession at all times so that they can take up to 40 mgms of Prednisolone or equivalent corticosteroid drug at once when necessary, especially if there is any difficulty in obtaining medical help or advice. Delay can be dangerous, as many deaths from asthma have been found to be due to not having steroids soon enough. The commonest cause of death was not getting oral steroids at all because the severity of the asthma had been underestimated by patient and/or doctor. In my experience this aggressive steroid policy has never caused problems, but delayed giving of oral steroids has produced many serious situations and deaths. In my long experience short-term high dose steroids, even 40mgms Prednisolone a day or more for as long as three weeks, has never caused significant side-effects. The steroid tablets are absorbed into the bloodstream to reach the lining of the blocked and semi-blocked bronchi to dissolve the cells and sticky mucus from beneath the bronchial lining. The steroid usually prescribed is Prednisolone which has been enteric coated to prevent the drug dissolving in the stomach and causing ulcers, but I have seen only one bleeding ulcer from steroids since 1956. The red enteric coating on the Prednisolone tablets is intended to delay the absorption of the tablet until it reaches the intestine, avoiding liberating the drug in the stomach. In occasional cases I have found that this coating prevents absorption altogether just when it is most needed and the tablets literally go down the drain. In some patients 40mgms of enteric coated Prednisolone per day for weeks had been totally ineffective, and in two instances admission for intensive care was required. My preferred steroid for many years has been Betnesol (betamethasone phosphate) because it dissolves in water, can be well diluted in any fluid to prevent any gastric irritation, is absorbed almost as fast as an intravenous injection, and is much more acceptable than tablets for children. In the few cases who had not responded to large doses of enteric Prednisolone the administration of this soluble steroid caused dramatic improvement in only a few hours, but surprisingly this soluble steroid it is largely unheard of and is very seldom prescribed. Unfortunately this steroid contains erythrosine dye which is quite unnecessary and can cause problems in some patients, but because of regulations it would entail much red tape and expense to alter the formulation, and allergy to this dye is very uncommon. From 1970 onwards the propellant gas in Becotide inhalers was ChloroFlouroCarbon or CFC. The liquid gas contained a suspension of tiny particles of the steroid drug which was inhaled and settled on the walls of the bronchi to suppress the allergic reaction. Using radioactive aerosols of Becotide (Beclomethasone Dipropionate) in a CFC inhaler it was demonstrated that the particles of suspended steroid drug reached only the larger bronchi, and hardly any reached the smallest bronchi, as shown. When it was discovered that escaped CFC gases, used world-wide for refrigeration and air-conditioning, were destroying the ozone layer which protects the world from too much ultra-violet radiation, these gases were banned world-wide, including medical aerosols. Fortunately a substitute gas ( Hydro-flouro-alkane or HFA) was discovered which is even better than CFC because instead of the drug being suspended it is dissolved in the liquid gas. The result is that for the first time really tiny particles of the steroid drug as small as one micron, penetrate down to the very smallest bronchus, as shown. This is of great potential importance for chronic asthmatic children who may have to take a steroid aerosol for life because for the very first time the whole developing bronchial tree can be be treated by with steroid aerosols . These developments were about ten years ago but these aerosols have not been used widely until recently when all aerosols for asthma have had to change to HFA because of the global ban on CFCs . As long ago as 2003 I wrote to the editor of the Lancet pointing out the importance of these developments but with no effect. The first aerosol to generate the finest particles was called Qvar and used Beclomethasone, the very first steroid aerosol from 1968, but was very seldom prescribed, and some pharmacy advisers would not let GPs prescribe it . In fact GPs had become so fixed in their prescribing that it has taken about ten years to change it. Some inhaled steroids are administered as inhaled powders composed mainly of lactose, a sugar derived from milk which may contain traces of milk protein. Milk sensitive patients can have their asthma made much worse if this fact is not known. The particles are obviously larger and will not penetrate the bronchial tree deeply enough. The prevalence of Asthma continues to increase year on year, allergies are more important as a cause of asthma and eczema in children than in adults, and many severely asthmatic children will grow up into asthmatic adults. When asthma is allowed to become chronic permanent changes will eventually become established by ‘remodelling’ of the bronchial tubes whereby the walls become thicker and stiffer. Even if the cause is identified and avoided completely it will be a long time before the irritability of the bronchi will cease, hence ‘remodelling’ may be irreversible. More or less effective suppression of the allergic inflammation in the bronchi with drugs is usually the only treatment in the UK today. This inadequate therapeutic approach will inevitably lead to an increase in numbers of chronic asthmatic adults. It is surprising how few Paediatricians (medical professionals who specialise in children) do not seem to be interested in finding out why their hospital wards are crowded with wheezing children. Asthmatic children often do not get better spontaneously at age seven or fourteen years, yet parents may still be assured that they will do so. 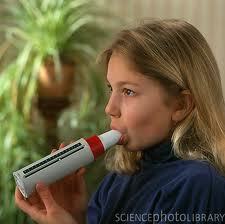 Even those children who lose their asthma in adolescence quite often relapse in later life. Even when asthma is effectively suppressed with drugs these children are still becoming permanently programmed to respond to common allergens such as dust mite. This is because the allergic reactions in the bronchi are only suppressed, not stopped altogether.. This also means that even if these allergy victims are properly investigated and their allergies sorted out after they have grown up into adults, the prospect of really significant improvement is less than it would have been if they had had proper investigation and treatment when they were young and completely reversible. This suggests that in future the numbers of established chronic asthmatics will increase, unless the allergic factor is properly dealt with in childhood, not in adulthood when it may be too late. Full instructions on avoidance of the common causes of asthma and guidelines for treatment are freely available today from many sources, and should be in full operation in any medical practice where there is a special asthma clinic, so there would be little point in repeating them here. This has gradually come to pass over the years, and has led to a great improvement in management. The stressed GP has neither time nor the knowledge to investigate asthma, but the nurse specialist has the time, has a special interest, and should be able to carry out skin testing, although this is still uncommon. Advice on the importance of pets in causing allergies is seldom pursued as vigorously as it should be and advice on avoidance not taken seriously, or ignored The main role of the nurse specialist is to make sure the patients use inhalers and peak flow meters properly, and have a management plan. Measures to reduce the dust mite, the most common cause of asthma, chronic rhinitis, and eczema, are difficult and expensive. 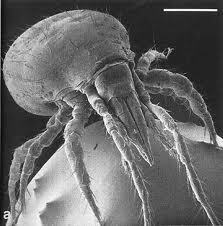 Powerful and expensive vacuum cleaners are advocated for the removal of the mites, but cannot drag the mites out from the depths of the carpets. In recent times the availability of affordable laminated flooring to replace the fitted carpets which have been an ideal home for mites for many years has been very helpful. Special mite-proof covers for mattress and pillows are helpful, but expensive. Pillows with synthetic fibre stuffing have been sold as ‘anti-allergenic’ for many years, but have recently been clearly proved to accumulate a huge mite population in a few months, much worse than the down pillows doctors have been advising patients to throw away!. This is because down pillows have finer woven covers which are less permeable for mite faeces, and of course they are much more comfortable. There is no doubt that a very large and lucrative market has grown up in selling all these measures to fight the mite, and that most people know that the mite is a major problem for allergy, but the results are often disappointing. My personal experience with Acarosan to kill off the mites is another story which will be told in a special section of this website. Steroid Phobia and unreasonable fear of side-effects is very common, but except for unavoidable long-term use of oral steroids, when the side-effects can be regarded as the price that has to be paid for the beneficial effects of the drug, these fears are grossly exaggerated. Inhaled steroids for asthma, such as Becotide, Pulmicort, Budesonide, Flixotide, Qvar, and others, and also steroid nasal sprays, rarely cause any problems except for occasional thrush. Many children who attended my clinic started using Becotide from 1970, when they took part in the very first trials, and are still using it daily without problems over forty years later. When chronic asthmatics become pregnant there is often fear of side-effects on the foetus which are quite unfounded. I will never forget a patient who died of asthma because the obstetrician who was looking after her did not ask my advice and withheld steroids until it was too late. It seems glaringly obvious that lack of oxygen due to the asthma is much more likely to harm the foetus than steroids, yet there are still misgivings by both doctors and patients about steroids in pregnancy. Steroid phobia also applies to inhaled steroids, steroid creams, and other steroids which are applied locally to the part of the body which requires treatment. It takes years to produce thinning of the skin and bruising from using creams, and local applications hardly ever cause generalised effects unless used very excessively.. Unfortunately patients may not use their inhalers or creams for fear of side-effects and even withhold these treatments from their children with asthma or eczema. It seems that these concerns are seldom explained to patients, who may not ask for advice during a hurried consultation.